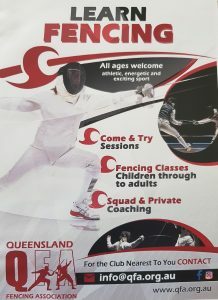 The Moreton Bay Fencing Club teaches beginners between the ages of 9 and 17 years old. The club runs on Mondays, Wednesdays and Thursdays between 4pm and 6pm at Inside Sportz Strathpine. If you would like to learn the game, be more competitive or complete at a higher level this is for you! We also have Tailored coaching available. Come as a group or individually, there will be skill development with games played at the end.